Ripley’s Aquarium of Canada, set to open in summer 2013, is a member of the Ripley Entertainment family of worldwide entertainment facilities, which includes two existing aquariums. Ripley’s Aquarium of the Smokies in Gatlinburg, Tenn., is the second-most-visited attraction in the state, and was voted the No. 1 aquarium in America by TripAdvisor.com. Ripley’s Aquarium in Myrtle Beach, S.C., is that state’s most visited attraction. The two aquariums have entertained nearly 30 million visitors since 1997. Ripley’s aquariums are known for their shark exhibits that feature 10-foot sharks and two of the longest underwater tunnels in North America. More than 12 million people visit Ripley’s 80-plus attractions in 11 countries each year. Ripley Entertainment Inc. is a division of the Jim Pattison Group, the third-largest privately held company in Canada. * Food service and retail store. The Aquarium will be open 365-days-a-year, starting in the summer of 2013. * During the first 20 years of operation, the Aquarium is expected to generate more than $220 million in tax revenues for all three levels of government. * The City of Toronto is providing property-tax incentives throughout a period of 12 years under the IMIT (Imagination, Manufacturing, Innovation and Technology) program for Ripley’s Aquarium of Canada. IMIT seeks to increase the number of new and renovated industrial and commercial properties throughout the City to support employment in targeted sectors, including tourism, and was unanimously approved in 2008 by City Council. 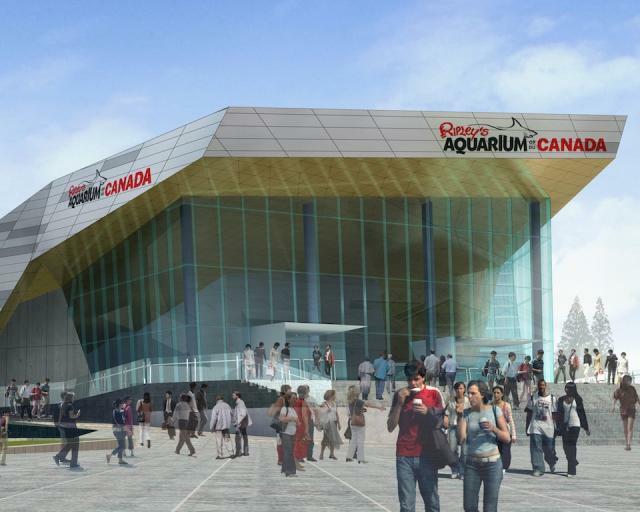 The City’s property-tax incentive for the Ripley’s Aquarium of Canada is currently estimated at $8 million to $12 million. All programs will provide quality, educational experiences that also promote conservation and entertainment. Our programs are developed with a diverse population in mind, and will be taught both on-site and in the community through our outreach programs. The responsibility for animal welfare and conservation at the Ripley’s Aquarium of Canada falls under the leadership of Joseph Choromanski, Vice President of Animal Husbandry. With more than 30 years of marine-science experience, Choromanski holds a master’s degree in fisheries biology and a bachelor’s degree in marine biology. Together with his team of 34 marine biologists, scientists and veterinarians, he has overall responsibility for the company’s animal collection. Prior to joining the Ripley’s Aquarium team, Joe was the Curator of Husbandry Operations at California’s world-famous Monterey Bay Aquarium; Assistant Director of Husbandry and Senior Curator of Water Quality and Animal Health at the Aquarium of the Americas in New Orleans, Louisiana; and Aquarium Curator at the Virginia Institute of Marine Science, College of William and Mary. Joe is a recognized expert in animal husbandry with numerous published articles and has testified before the U.S. Congress on the conservation of sea turtles. He is very active in the Association of Zoos and Aquariums (AZA) and has served on its Accreditation Commission for nine years. He currently serves on AZA’s Government Affairs and Wildlife Conservation Management Committees. CONTEST: Win Tickets to Ripley's Aquarium of Canada!